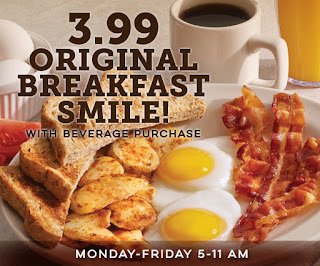 Start your morning off with a smile – our 3.99 Weekday Breakfast Smile! 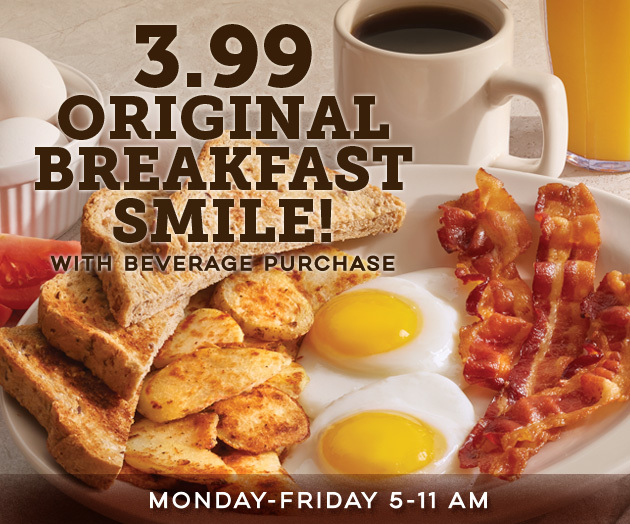 Available Monday through Friday from 5-11 AM, you can enjoy our Original Breakfast Smile for just $3.99 with the purchase of a beverage. This classic dish includes two eggs, three pieces of bacon, sausage, or turkey sausage, toast and breakfast potatoes. It will be gone before you know it so stop in for this great offer today! This promotion ends Friday, October 7th, 2016. Thank you for your comment! We'll be sure to pass along your feedback to our team! The potato pancakes are the best choice! THANK YOU for this special! We dined with you for breakfast Friday and enjoyed a delicious meal at a very nice price. I also want to comment that your nutrition info has helped tremendously as I learn to count carbs with my new Insulin pump.